If there's one thing I love to do more than eating, it's cooking! My dad has always been the chef in the house (although my mom can sure cook up some Dominican food), so as an only child cooking became sort of a hobby my dad and I shared. Having a family means I get the pleasure of cooking at least five times a week, so finding new things to make is always fun. Tonight I want to share a recipe that has become a hit in my house, and I must thank Paula Deen for this one (with a few twists of my own). Preheat oven to 400 degrees F. Line a baking sheet with heavy-duty aluminum foil. Place a cooling rack over pan and spray rack with nonstick cooking spray. In a shallow dish, combine bread crumbs, cheese, 2 tablespoons melted butter, thyme, salt and pepper, to taste. In a separate shallow dish, combine mustard, egg, water, salt and pepper, to taste, and olive oil. 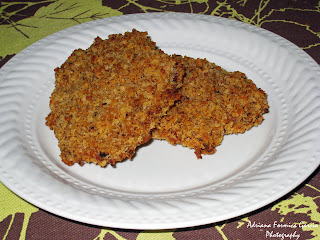 Coat each chicken breast with mustard mixture; dredge each in bread crumb mixture. Place on prepared rack in pan. Bake for 30 to 45 minutes, or until chicken or pork chops are golden brown. Serve immediately.